When we initially saw the first images of the DJ-808 we weren’t quite sure what to make of it. Would it be taken seriously by DJs, or would they see it as a novelty product from companies that should know better? Well, on unboxing the controller, we were happily surprised. The pictures that we initially saw were deceiving. The look and the build quality of the controller were immediately impressive. This was reinforced when we turned on the controller and started playing on it. The visual LEDs, the firm action of the knobs, sliders, pads and buttons and the thoughtful layout all came together nicely. Additionally, the weight of it, just the right side of heavy, was a relief. Straight away, from our initial tinkering it was obvious that Roland was serious about entering the DJ sector. We suppose this should have been obvious in the first place, as we doubt Serato would have jumped on board if it was not going to be a product to garner respect. So, who is the DJ-808 aimed at? 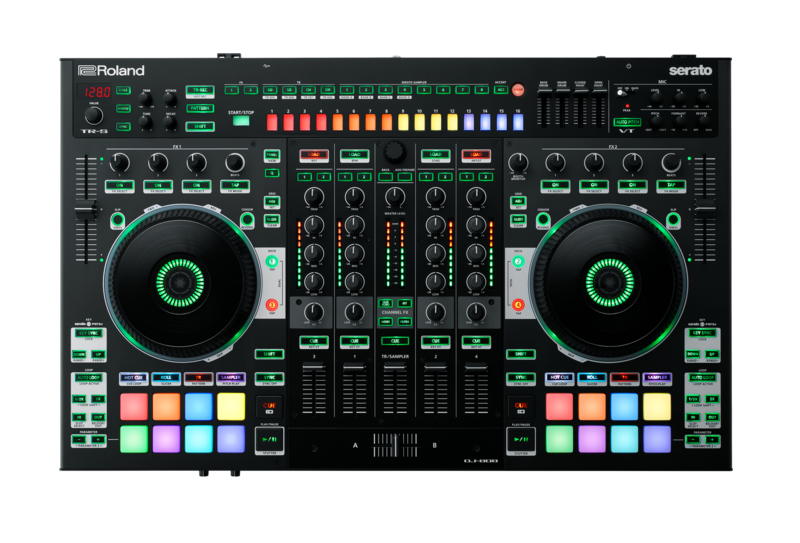 Straight up DJs who simply mix their records will probably choose another option for a controller, but DJs who are now breaking out of the standard two-deck mixer-type performance will quickly see what the attraction is with the DJ-808. Potentially, this controller could find its mark in this tightly-filled sector. Roland has created an instrument that includes DJ functions. What makes up the DJ-808 is a drum machine (the TR-S) featuring sounds from Roland’s classic TR range of drum machines (808/909/707/606). The drum sounds can be routed through the Serato software with FX applied to them — this shows the deep integration that the two companies have applied to the build of the controller. The parameters of the drum sounds can also be adjusted directly from the hardware. Also, part of the make-up is a MIDI sample step sequencer, of which 16 patterns can be saved in the unit. Again, there is deep integration with the software, as the sequencer can sequence the Serato DJ sample decks. Just this alone makes for some serious DJ/musical performance capabilities. The other element that makes it not just a standard controller is the vocal transformer, which can be utilised by singers or DJs to creative effect with its auto-tune capability. We messed around with this, but as we are not accomplished vocalists, our attempts to do a James Blake/Nicolas Jaar were limited. Still, it is clear to see the potential of what can be done in this section alone. The instrumental side of the controller sits on top of the DJ section, which is made up of the usual deck and mixer components. The ‘Ultra Low Latency’ jog-wheels have a great feel, and the tightness and accuracy with which they control the Serato DJ software is apparent. The rest of the deck section is in-keeping with most of the modern controllers out there, with eight RGB performance pads (four of those being velocity-sensitive), loop, pitch, sync, mode select buttons and transport controls. The mixer section is made up of a crossfader and five upfader channels. Four of these are audio channels with EQ, independent track load buttons and FX control dials that control the channel FX, while the fifth in the middle takes care of the volume level of the TR-S drum machine and sampler. The mid sector also contains the master level knob, visual volume LEDs and a menu/track scroll dial. The mixer is also capable of being used as a standalone unit independently of the Serato DJ software. It has a good selection of inputs and outputs. Extra hardware and external audio sources can be hooked up to it in addition to the usual media players and turntables; it also comes with MIDI out as well as having two additional AIRA Link USB ports, reinforcing the possibility of using the DJ-808 as the central hub for a DJ/live/studio set-up. 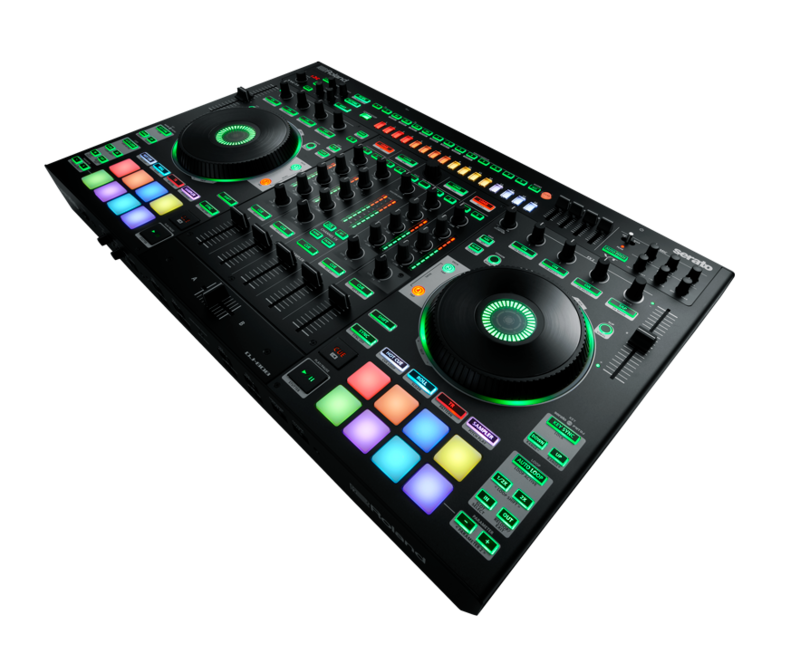 And with Roland leading the charge with its AIRA and Boutique range of synths, it is a no-brainer that it sees the appeal in creating a custom set-up with the DJ-808 as the centrepiece of the action that can sync up to their other bits of kit and also be the central MIDI clock device. The sound quality of the DJ-808 is good. We matched it up against a few other controllers in the price bracket as well as other media players and mixers and were happy with the depth and quality of the sound. We had fun putting the DJ-808 through its paces. As a controller it is solid and rates up there with the best of them, but we think its strength lies as an instrument with additional DJ capabilities. It begs the performer to be more creative with its use. Roland could be on to something here. It’s obvious that Roland and Serato have seen what can be done when DJs start to explore ‘live’ performances, and this collaboration places both companies in a good position to expand on this ever-growing sector of DJ performance. DJ Mag Tech would love to see a full-on band performance with the DJ-808, a choice selection of synths and other tasty bits of kit all hooked up together. Unfortunately we didn’t have the DJ-808 (long enough) and everything else we needed (Roland AIRA/Boutique synths and a band/friends) to really test it out to this level of musicianship. But we’ll be back with a separate review sometime in the near future when we have had a chance to delve deeper into this side of the DJ-808. For now, we were impressed with what Roland and Serato have done. A quality controller, that goes beyond just a DJ tool. A built-in soundcard would have been the icing on the cake. The DJ-808 is a great controller with a lot of facets that make it very versatile indeed. It takes its name from another of Roland’s legendary products, however time will tell if this controller will take its place in the DJ kit hall of fame.